The preparations for sewing the jacket I'm wearing to Carole and David's vow blessing ceremony included clearing off the living room table. I had deposited items that I wanted to address but which were not crucial to life, such as bills. I have trained myself so bills go in one specific place, period, and immediately upon receipt. I don't even open them. They go rightthere and I always know what I have to pay. Letters, cards, interesting bits, well, they get piled. I don't have a filing system. I have a "piling system". Oh yes, the thing I want should be in this pile here. On the table were letters from Christmas cards, Valentine cards, "thinking of you" cards, letters received in the past month, a really old one from December and one from January. That friend told me she was moving two blocks north. I don't think I have that address. Wonder if she did? So part of the clean up of the table was to NOT just move the pile into the office but to go through each and every piece of paper and do something with it. I have enough stamps. Patt and Terry sent me note card-sized stationary for Christmas. I have no excuse other than my inertia and, on Saturday, I was overcoming that. Two parcels with baby gifts were wrapped, labeled and made ready for shipping today. 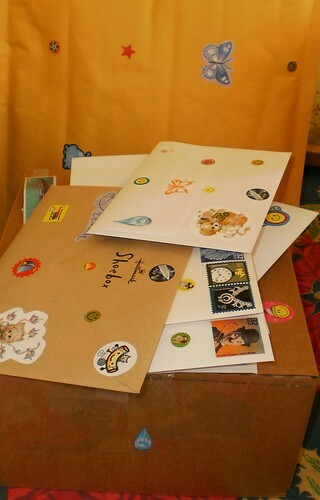 I hand wrote 8 letters, applied my stickers and stamps and made a pile next to my purse on the kitchen table. Have to take my purse in the morning so I have no excuse not to grab the stack. On purpose, today, I did not pack a lunch, which forced me to leave the office in search of foodstuffs. That allowed me to swing by the post office and drop everything into the mail. Therefore, some of you could see an honest to gosh letter by Wednesday. I know you will be shocked. I hope, ultimately, you will be amused and maybe even happy to receive it. I'm feeling so good about clearing off that table, I'm looking at the table in the office and thinking, I should look through this stuff. Some people might even get 2, count 'em, 2 letters because I find something from you I know I didn't answer. On the down side, I'm running out of stickers. I'll have to watch for Hobby Lobby's 50% off sale and see if I can squeeze a $10 sticker purchase out of the budget.